It is the time of year for socialising, catching up with friends and family, end of year events, and holiday time. If you have worked hard all year to keep good health, and want to minimise the effects of the festive season, here are some tips to help you. Stay hydrated with water or iced herbal teas. Start the day with warm water and ½ squeezed lemon. Keep hydrating through out the day with water or iced herbal teas. Make your water taste a little more exciting by adding some mint and cucumber. Aim for 30 mls per body weight and add extra if exercising. Start the day off well – eat a wholesome breakfast with protein, fat, and complex carbohydrates. Homemade muesli with fresh berries and yoghurt, or eggs with spinach and whole grain toast are great to keep you fuller and satisfied for longer. I love a smoothie with coconut milk, berries, protein powder, ground linseed and ice – YUM! Portion sizes – the guidelines below will help to avoid loading up your plate and consuming larger than normal quantities of food. Dessert – this time of year there a lot of yummy fruits -cut these up and serve with thick Greek yoghurt or unsweetened cream. Don’t have it every night – remember it is a treat food! Snacks – try cutting up vegetable having hummus instead of chips and dip. A handful of unroasted and unsalted nuts or a boiled egg will help to keep hunger at bay and prevent the overeating at the end of the day. If you do come unstuck don’t get stressed just get back on track the next meal or day. Alcohol – aim to have at least 3 alcohol free days a week. If you are drinking – have a glass of water between each alcoholic drink. 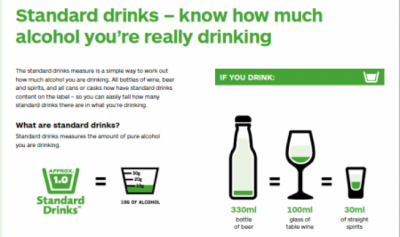 Watch the amount of alcohol consumed in one session – aiming to drink no more than 4 standard drinks for females and 5 for males. Binge drinking has a far more detrimental effect on our health, and we need to keep a mindful eye of how we drink. Holidays and socialising is meant to be fun, and it’s not fun to feel like you’re missing out on your favourite foods. There are so many good food options available, you can eat these beautiful heathy foods, and still not feel you are being deprived! Keep in mind that eating habits are all about the big picture, not one meal. Remember it is about what you do most of the time – not some of the time. Have a wonderful and safe break, and I will look forward to catching up with many of you in 2018!